Do your kids think a birthday is not a birthday unless there is some semblance of a cake or cupcakes? Mine do. Which is fine…when it is their birthdays. I love getting creative in the kitchen for them. But when it is mine? I could really take or leave the whole birthday dessert idea. A day off from the kitchen sounds far more appealing to me than adding pounds to my waistline…especially since my Mom is a state away and will not be whipping up one of my childhood favorites this year. So because my boys think my birthday will be a complete failure without a special dessert involved, I found myself in the kitchen deciding what I would be making to celebrate the year that brings me just another gray hair away from forty….and to make sure that my sons did not garner horrible childhood memories of their mother being totally deprived on her birthday. So? I first thought about whipping up some Gluten-Free Black Forest cupcakes. And then I thought about those Gluten-Free Mini Pineapple Upside Down Cakes that we all love so much around here. After all, those are the two desserts that I have the fondest birthday memories of and biggest cravings for. But, as I looked around my kitchen and found my eyes resting on the gorgeous pile of plums waiting for their destiny, I decided to get creative and create a new memory. After all, those juicy plums will not be available for much longer as their prime season starts to fade away into fall. 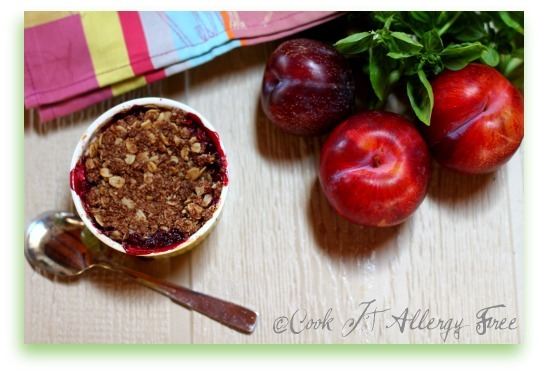 So, I am making Mini Gluten-Free and Dairy Free Plum Crumbles. They are also Refined Sugar Free, Egg Free, and Soy Free. Yippee! My boys might balk. After all. There is no frosting. But, hey. If they complain?…….All the more for me. This recipe is actually my gift to you. Trust me. You will enjoy it. And you will be really glad I did not decide on cupcakes this year. You will not even miss that frosting. 1. Preheat oven to 375 degrees. Lightly grease four 6 oz Ramekins. 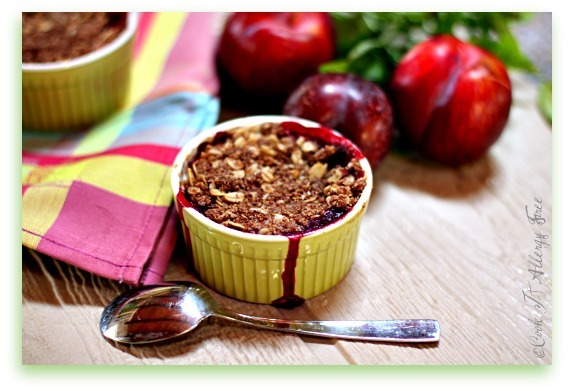 In small bowl, mix together filling ingredients: Plums, 4 tsp Flour Blend, Coconut Palm Sugar, Cinnamon, and Vanilla. Divide evenly between your ramekins. 2. In another bowl add your chilled Coconut oil (or Butter or Butter Alternative), Certified Gluten Free Oats, Almond flour, 1/4 cup Gluten Free All Purpose Flour, Ground Chia or Flax Meal (if using), Coconut Palm Sugar, and Sea Salt. Use a pastry blender (or a fork) to crumle/cream your ingredients together until coarse meal forms. 3. Divide topping evenly among each ramekin. This makes a lot of topping. Place ramekins on a baking sheet and place in the oven for 25 minutes (filling may bubble over – you can line baking sheet with foil for easy clean up, if desired). If you like a crispy top, you can turn the broiler on for 2-3 minutes at the very end, but watch VERY carefully if you do this so it does not burn! **Note: Measurements for Coconut Oil should typically, in most baking recipes, be measured in liquid form for the correct volume measurement. Yum! I love a good fruit-based dessert. In fact, I’ll take crumbles and crisps over cakes and cupcakes anyday. 🙂 Happy birthday! Happy Birthday dear friend! The last pic here is proof that these are delish and were thoroughly enjoyed. I hope you get some time out of the kitchen tonight … and a few more surprises on top of that! Enjoy your day! Thanks for the birthday wishes, Lexie!! These were definitely enjoyed. I almost posted a picture of my little guy while he was licking the bowl. Had a great bday celebration. Kurt gave me some nice surprises this year! Happy Birthday!!!! What a delicious recipe! I have been wanting to try something like this, I just bought Gluten-Free Oats! 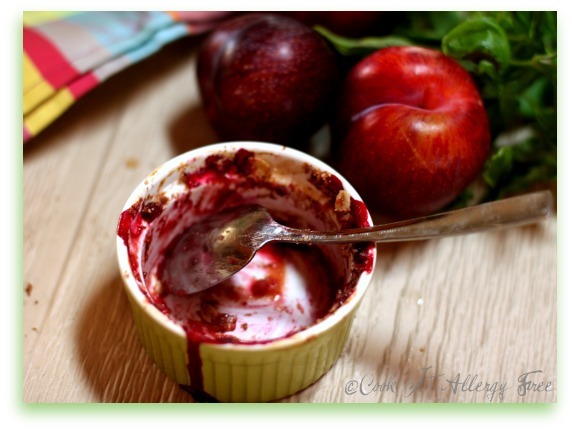 What a perfect time for this recipe now that plums are in season! I will subsitute stevia for coconut sugar, but for those that want a low glycemic sweetner, coconut sugar is one of the best choices! Great recipe! I think I’m just obsessed with food made in mini versions. These are too cute. And they look delectable. Happy Birthday! Happy Birthday Kim! Looks like a great end to what I can only hope will be a day as special as you are! Carol, thanks for the super sweet birthday wishes, my friend. Happy Birthday Kim! Gosh, I could just reach through this screen and lick the bottom of your bowl, that last pic is such a tease! I hope you are have the most wonderful day! LOL! Heidi girl, you just crack me up! Maybe I will have to make a grain-free version of these for you when you come to visit! Thanks for the bday wishes, my friend! You stated your case so PERFECTLY. Hope the boys enjoyed your treat. I thought of you all day and kept wishing happy thoughts for you. Too bad I didn’t get to make one of your favorites. You so deserve to be pampered. Thanks Mom! Love you. And, as you know, I was totally pampered. Kurt earned big brownie points this week! I’m not that into frosting either. Happy Birthday, and I hope the boys let you eat these without any guilt! InTolerantChef, I think frosting is way over-rated! LOL And I totally enjoyed these guilt-free!! Thanks for the birthday wishes. Happy Birthday! This dessert looks and sounds amazing! I will be trying this for sure! Thanks Holly. 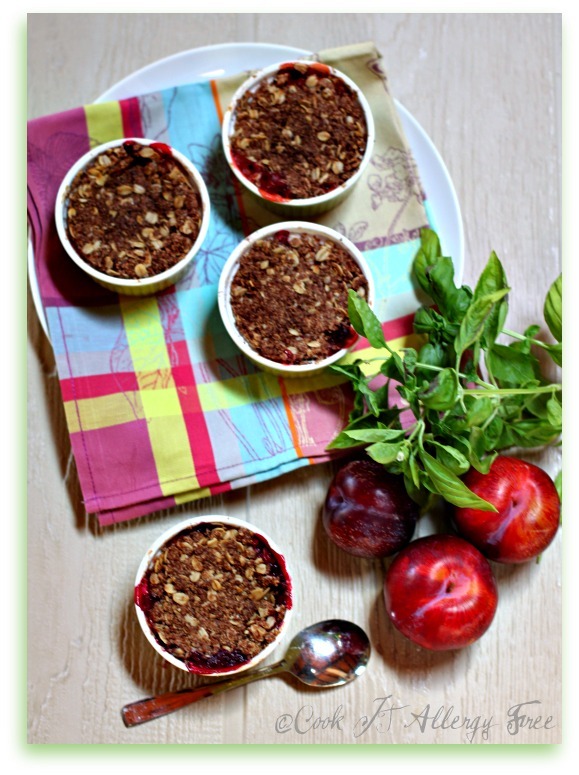 Hope you enjoy the plum crumbles! Mmmm I want one right NOW! Can I come to your birthday party next year please? I love cobbler and I’ve never thought of trying a plum one. What a GREAT idea! Pics are gorgeous as always. And frosting is for preschoolers 🙂 Hahah! Happy Birthday! I do the same thing with my birthday…I find myself baking something to celebrate the occasion for the boys. Although last year I went with a gluten free angel food cake and that has now stuck for everyone’s birthday. The toppings change, but the base is the same. I hope your birthday is full of happy times! Hi Susan! Blackberry crumbles are actually one of my favorite types of crumbles!! Hope you enjoy! Happy late birthday! First off, I can hardly get past those gorgeous bunches of basil (isn’t that what that is in the photo). Now, I’m wondering if basil goes with plums. Is that from your garden? How about a basil and tomato GF pizza for dinner, followed by plum crumble? I wish I had been at your birthday party. These little gems look better than any cake I’ve seen. BTW, your photos are so amazing (as always)! Melissa, you are totally right. That is basil. I had just brought it in from the garden and originally had not meant for it to be in the picture, but it was laying there when I was doing a practice shot and the color looked so pretty with those plums. I have so much basil right now that I guess using it in pictures makes it feel like I am putting it to good use at least! LOL And..I totally wish you had been at my birthday party too! How fun that would have been. PS Just got the Facebook thing fixed. Not sure what happened there, but my designer fixed it for me!!! Thanks for giving me the heads up! Great job on your plum crumbles, dear! When it’s your birthday, you should certainly make whatever delight you want. I do wish I could make you some treat that’s lovely and comforting for one of your birthdays though. Maybe next year? 😉 Keep celebrating, dear! Birthdays are meant to be savored. Happy, happy, happy birthday! Shirley, one of these years we will be together on one of our birthdays to celebrate together and to make each other a special dessert!! Next year sounds like the perfect time. We could celebrate both at the same time since they are only just over a month apart!! Thanks for the sweet birthday wishes!! Yum Yum Yum. I love plums and this looks like a great way to use them. I have a bowl of Italian plums just waiting for me to do something with them. I love how fruit just asks to be eaten. Happy Birthday and I hope they didn’t make you load it up with candles! Mmmm. Italian plums? Those sound delicious. And, no…I talked them out of the candles. I told them that we did not want to start a fire in the kitchen!